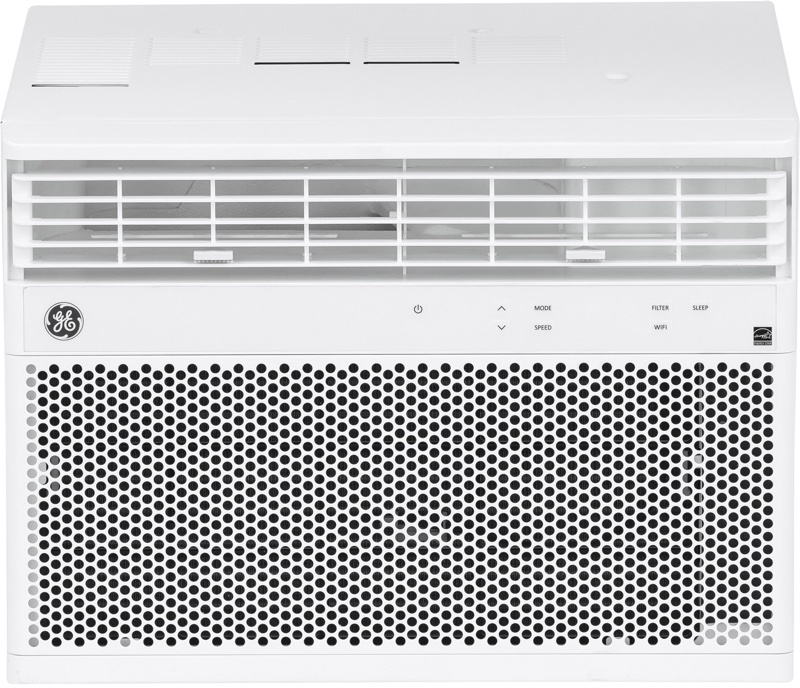 After a soft launch of just one model earlier this spring, GE today announced the launch of its full lineup of HomeKit-enabled window air conditioning units. While there are a few other HomeKit air conditioners on the market outside of the United States, the new units represent the first HomeKit-compatible air conditioners to launch in the U.S.
GE's air conditioners deliver 8,000 to 12,000 BTUs and can cool medium- to large-sized rooms, according to the company. With HomeKit control, customers can add the units into the Home app on iOS, connecting them to Scenes, controlling them with Siri, or automating them to activate and deactivate when they arrive and leave their home. “Consumers told us they like how they can create their own schedules to keep rooms comfortable without wasting energy,” said John Desmarais, Commercial Director, Window A/C, Portables & Dehumidifiers for GE Appliances. Each unit has cooling settings for four-way air direction and an "Energy Saver" mode that automatically shuts off the fan and compressor when the room is cool enough, reducing electricity consumption and helping to save money on monthly bills. Although HomeKit control is supported, GE's air conditioners also come with an electronic digital thermostat and remote control. Starting today, the units are available at The Home Depot (which has three models) and Lowe's (which has two models), and at local authorized GE Appliance dealers. Prices on the units vary depending on the amount of BTUs, starting around $279 (8,000 BTUs) and increasing to $349 (10,000 BTUs) and more. And not shipping until 2019 in a 5000 BTU non-homekit compatible unit only. So happy to combine this with the new Shortcuts app. Now I can finally yell, “Siri! It’s too damn hot up in here!” and my AC will turn on. These are a bit more expensive than non-homekit AC units. I have a homekit power plug that I use for my AC unit, which works well. Yes but you can’t control the actual temp. I'm wondering if getting something like this would help us save money on our electric bill? My wife has a daycare downstairs in an area that is 800sqft. But during the day our a/c cools the entire house. Would it be cheaper to install something like this or instead somehow split our upstairs and downstairs cooling? And I wonder if I would need to put a door between the upstairs and downstairs to keep the temperature regulated. Right now we just have a swing open baby gate. There's no hard and fast definitive answer to your question. The most accurate answer is maybe. A lot of variables have to be taken into account. Unit efficiency - is it more efficient than your home unit. Space config - open? divided? rooms? Occupancy and activity - how many kids? How much of your basement is in ground? There are many other variables to consider. Just some observations if anyone cares. I have one in my apartment. And I have a Homekit automation that sets the AC to cool when I leave work. Since my schedule varies, it works better than a timer. However, since buying this, I bought a conventional AC window unit for my bedroom which I will use with a smart plug. Since getting the GE, I found a smaller unit with manual settings and power-loss restart features making it perfect for a smart plug. And with the smart plug, I can use an external temperature sensor to trigger the AC versus the internal one, (if it's a wonky as the GE unit's.) I haven't installed it yet, but I'm hoping it'll also be a fair bit quieter. The GE AC was the first real Homekit device I used besides a smart plug. And it's been great to check to see if I left the air one once I've left the house or start it on my way home. I make it a point to try to get up to turn it on and off when I'm in the living room because I don't want to be THAT lazy. But I have used the AppleTV remote to turn it on and off from the couch more than once. EDIT: Also, there are some features that are only available through the GE appliances app with an account. I've so far chosen not to get 3rd party accounts for extended features (iHome, GE, Hue) as the less external servers knowing what's in my home the better I feel. Quick heads-up for ConEd customers: they'll give you a free remote device to control your plain, non-networked A/C unit. I used it last year and it was ok. I'm sure it's not HomeKit compatible, but considering I have zero HomeKit devices in my apartment, it's not really a deal-breaker for me to use their app instead of being able to yell commands into my phone or whatever. Good point. I set mine at 68 all the time during the summers. I am intruding into your personal preferences because I know 68 degrees F is too low to set for cooling mode - that is the temperature for heating. I have ceiling fans installed in all the rooms and my A/C bill is down by more than $120/month in the peak hot weather. A good electrician can snake an extension to rooms with no ceiling outlet. While it'll still let some cool air come up the stairs, the majority will stay downstairs (cool air doesn't rise like hot). Many houses have split cooling/heating systems with different systems for different parts of the house. They don't separate them more than like a staircase. For instance, I had an ex who's parents had a huge home. They had a separate cooling/heating system for the upstairs where the 3 bedrooms and bathroom their kids use to use before they grew up and moved out, were located. They only turned this system on when people were going to use those rooms (like when we came to visit). The stairway going up there was the only separator. No need for a door. The majority of the heat/cool, is going to stay to the area that system is venting to. Getting the thing connected to HomeKit is a pain. Our experiences are pretty similar with the exception of this point. I literally scanned the HomeKit badge and that was it.